High mobility group box protein 1 (HMGB1), a DNA binding nuclear and cytosolic protein, is a proinflammatory cytokine released by monocytes and macrophages. This study addressed the hypothesis that HMGB1 is an immunostimulatory signal that induces dendritic cell (DC) maturation. We show that HMGB1, via its B box domain, induced phenotypic maturation of DCs, as evidenced by increased CD83, CD54, CD80, CD40, CD58, and MHC class II expression and decreased CD206 expression. 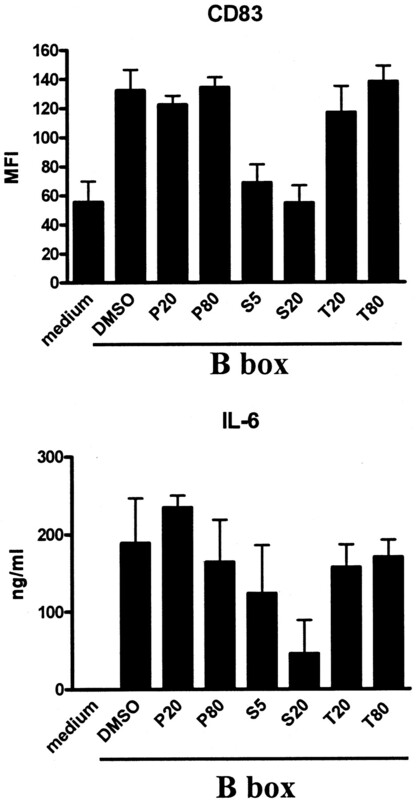 The B box caused increased secretion of the proinflammatory cytokines IL-12, IL-6, IL-1α, IL-8, TNF-α, and RANTES. B box up-regulated CD83 expression as well as IL-6 secretion via a p38 MAPK-dependent pathway. In the MLR, B box-activated DCs acted as potent stimulators of allogeneic T cells, and the magnitude of the response was equivalent to DCs activated by exposure to LPS, nonmethylated CpG oligonucleotides, or CD40L. Furthermore, B box induced secretion of IL-12 from DCs as well as IL-2 and IFN-γ secretion from allogeneic T cells, suggesting a Th1 bias. HMGB1 released by necrotic cells may be a signal of tissue or cellular injury that, when sensed by DCs, induces and/or enhances an immune reaction. The initiation and control of an adaptive immune response is critical for health and disease. Dendritic cells (DCs)2 are central to these processes (1, 2). DCs detect evolutionarily conserved molecular structures unique to foreign pathogens, such as LPS (3), DNA molecules containing unmethylated CpG motifs (4); they also respond to endogenous signals of cellular distress or damage (5, 6, 7, 8). Interaction with these agents stimulates DCs to undergo the process of maturation. Endogenous factors that cause DCs to mature are an important class of stimuli that might contribute to the initiation or perpetuation of an immune response against pathogens. In contrast, if these factors are released chronically and/or in the absence of infection, they could potentially contribute to the activation of self-reactive T cells and play a role in the development of autoimmunity (5, 6). High mobility group box protein 1 (HMGB1), a nuclear and cytosolic protein, was originally identified as an intranuclear factor with an important structural function in chromatin organization (9). Recently, HMGB1 was identified as a proinflammatory cytokine that mediates endotoxin lethality, local inflammation, and macrophage activation (10, 11, 12). HMGB1 administered in vivo induces arthritis when injected into murine joints (13) and acute lung injury when administered intra-articularly (14). HMGB1 is released by activated macrophages and monocytes after exposure to LPS, TNF-α, or IL-1β and as a result of tissue damage (15, 16). It is a also a potent stimulating signal to monocytes and induces the delayed synthesis of proinflammatory cytokines (11). HMGB1 contains two homologous DNA-binding motifs, termed HMG A and HMG B boxes (17, 18). The proinflammatory domain of HMGB1 maps to the B box, which alone is sufficient to recapitulate the cytokine-stimulating effect of full-length HMGB1 in vivo (19). The intracellular abundance of HMGB1 and its proinflammatory activities suggest that its release at sites of cell injury or damage plays a role in the initiation and/or perpetuation of an immune response. Furthermore, as HMGB1 is found in the serum of patients with acute (sepsis) and chronic (rheumatoid arthritis) inflammatory conditions (10, 20), it may be involved in maladaptive or autoimmune responses. Human recombinant HMGB1 or recombinant B box (rB box) was expressed in Escherichia coli and purified to homogeneity as previously described (21). Briefly, B box (233 bp) was cloned by PCR amplification from a human brain Quick-Clone cDNA (Clontech Laboratories, Palo Alto, CA). The primers were 5′-AAGTTCAAGGATCCCAATGCAAAG-3′ and 5′-GCGGCCGCTCAATATGCAGCTATATCCTTTTC-3′. The PCR product was subcloned into pCRII-TOPO vector EcoRI sites using the TA cloning method according to the manufacturer’s instructions (Invitrogen, Carlsbad, CA). After amplification, the PCR product was digested with EcoRI and subcloned into an expression vector (pGEX) with a GST tag (Amersham Pharmacia Biotech, Piscataway, NJ). The recombinant plasmid was transformed into protease-deficient E. coli strain BL21 (Novagen, Madison, WI) and incubated in 2-YT medium containing ampicillin (50 μg/ml) for 5–7 h at 30°C with vigorous shaking until an OD at A600 of 1–1.5 was achieved. Subsequently, fusion protein expression was induced by addition of 1 mM isopropyl-β-d-thiogalactoside for 3 h at 25°C. Bacteria were sonicated in ice-cold PBS plus 1× protease inhibitor mixture (Sigma-Aldrich, St. Louis, MO) and 1 mM PMSF. After centrifugation (8000 × g) to remove bacterial debris, the rB box was purified to homogeneity by glutathione-Sepharose resin column chromatography (Amersham Pharmacia Biotech). For use as a control in cell stimulation experiments, GST vector protein was expressed and purified similarly, then used as the control for experiments using GST-rB box protein. Protein elute was dialyzed extensively against PBS to remove the excess amount of reduced glutathione and was passed over a column with immobilized polymyxin B (Pierce, Rockford, IL) to remove LPS. The rB box purified to homogeneity contained trace amounts of LPS (19 pg LPS/μg rB box) as measured by the chromogenic Limulus amebocyte lysate assay (BioWhittaker, Walkersville, MD). For all stimulation experiments using the rB box, polymyxin B was added to the cell culture medium at 200 U/ml, an amount that completely neutralizes the activity of these amounts of LPS. The p38 MAPK-specific inhibitor, SB203580, a pyridinyl imidazole compound, the MEK inhibitor PD98059, and N-tosyl-l-phenylalanine chloromethyl ketone (TPCK) were purchased from Sigma-Aldrich. Because these required solubilization in DMSO, DMSO was used as a negative control. Polyclonal anti-RAGE Ab reactive with an extracellular region of human RAGE (peptide sequence SVKEQTRRHPETGLFTC) was raised in rabbits (Cocalica Biologicals, Reamstown, PA). IgG was purified using protein A-agarose (Pierce). To proteolytically digest HMGB1 proteins, trypsin-EDTA was added to HMGB1 B box (0.05% final concentration), and digestion was conducted in 1× PBS (pH 7.4) at 25°C overnight. Degradation of proteins was verified by SDS-PAGE before and after trypsin digestion by Coomassie Blue staining. T cells were isolated by negative selection using the RosetteSep Ab mixture from StemCell Technologies (Vancouver, Canada) according to the manufacturer’s instructions. The cell purity of the isolated T cells was routinely ∼99% pure. PBMCs were isolated from the blood of normal volunteers (Long Island Blood Services, Melville, NY) over a Ficoll-Hypaque (Pharmacia Biotech, Uppsala, Sweden) density gradient. CD14+ monocytes were isolated from PBMCs by positive selection using anti-CD14 beads (Miltenyi Biotech, Auburn, CA) following the manufacturer’s instructions. To generate DCs, CD14+ cells were cultured in RPMI 1640 medium supplemented with 2 mM l-glutamine (Life Technologies, Grand Island, NY), 50 μM 2-ME (Sigma-Aldrich), 10 mM HEPES (Life Technologies), penicillin (100 U/ml)-streptomycin (100 μg/ml; Life Technologies), and 5% human AB serum (Gemini Bio-Products, Woodland, CA). Cultures were maintained for 7 days in six-well trays (3 × 106 cells/well) supplemented with 1000 U of GM-CSF/ml (Immunex, Seattle, WA) and 200 U of IL-4/ml (R&D Systems, Minneapolis, MN) on days 0, 2, 4, and 6. On day 7 of culture, immature DCs were either left untreated (immature) or were stimulated with indicated doses of 1) LPS (E. coli serotype 026:B6, Sigma-Aldrich), 2) 500 ng/ml trimeric CD40L (Alexis Biochemicals, San Diego, CA), 3) a mixture of cytokines (CyC) consisting of IL-6 at 1000 U/ml, TNF-α at 10 ng/ml, IL-1β at 10 ng/ml (all from R&D Systems), and PGE2 at 1 μg/ml (Sigma-Aldrich), or with 4) nonmethylated CpG oligonucleotides (5′-tcgtcgttttgtcgttttgtcgtt-3′) at 30 μg/ml. The sequence of this oligonucleotide is known to induce DC maturation (4), except that it contains an unmodified phosphodiester backbone. In all experiments DCs were analyzed 48 h after stimulation. All experiments using the rB box were performed in the presence of polymyxin B sufficient to neutralize >10-fold more LPS than that present in rB box preparations. DCs (1 × 104) were reacted for at least 20 min at 4°C in 100 μl of PBS/5% FCS/0.1% sodium azide (staining buffer) with PE-conjugated IgG specific for CD206, CD54, HLA-DR (all from BD Immunocytometry Systems, San Jose, CA), and CD83 (Immunotech-Beckman Coulter, Marseilles, France) or with FITC-conjugated IgG mAb specific for CD80, CD40, and CD58 (all from BD Immunocytometry Systems). Cells were then washed four times with staining buffer, fixed in 10% formaldehyde in PBS (pH 7.2–7.4), and examined by flow cytometry using a FACScan (BD Biosciences, Mountain View, CA). In all experiments isotype controls were included using an appropriate PE- or FITC-conjugated irrelevant mAb of the same Ig class. Forty-eight hours after activation, the production of cytokines and chemokines in cell culture supernatants was measured by ELISA (Pierce Boston Technology Center, SearchLight Proteome Arrays Multiplex Sample Testing Services, Woburn, MA). To assess levels of cellular activation and proliferation, cells were plated at 105 cells/well in a round-bottom, 96-well tray at DC:T cell ratios of 1:120 for 5 days in the medium described above. The microcultures were pulsed with [3H]thymidine (1 mCi/well) for the final 8 h of culture. Cell cultures were harvested onto glass-fiber filters with an automated multiple sample harvester, and the amount of isotope incorporation was determined by liquid scintillation beta emission. Responses are reported as the mean cpm of thymidine incorporation by triplicate cultures ± SEM. DCs were collected 48 h after activation and were washed once in PBS. Nuclear extract was isolated using NE-PER nuclear and cytoplasmic extraction reagents according to the manufacturer’s instructions (Pierce). For detection of NF-κB binding, nuclear extract from cells (∼5 μg of protein) was incubated with 0.2 ng of 32P-labeled double-stranded oligonucleotide sequence in a 10-μl reaction volume containing 5× gel shift binding buffer (20% glycerol, 5 mM MgCl2, 2.5 mM EDTA, 2.5 mM DTT, 250 mM NaCl, 50 mM Tris-HCl (pH 7.5), and 0.25 mg/ml poly(dI-dC)-poly(dI-dC)) for 30 min at room temperature. For supershift experiments, 1 μl of Ab against the indicated NF-κB family members (Santa Cruz Biotechnology, Santa Cruz, CA) was added to the reaction mix 5 min before loading onto the gel. The samples were resolved on a 4% polyacrylamide gel and visualized directly by autoradiography after drying the gel. The NF-κB consensus sequence (E3292; Promega, Madison, WI) was labeled with 10 U of T4 polynucleotide kinase (M4101; Promega)/25 ng oligo, 1× kinase buffer, and 5 μl of [γ-32P]ATP (PB10168, Amersham Pharmacia Biotech; 10 mCi/ml) for 30 min at 37°C. Unbound ATP was determined on a Sephadex G-25 column (Amersham Pharmacia Biotech, Piscataway, NJ). To determine whether HMGB1 can induce DC maturation, recombinant HMGB1 was added to immature DCs, and increases in CD83, MHC class II, CD54, CD86, and CD40 expression and a decrease in CD206 expression were observed (Fig. 1⇓A). Previous work has linked the proinflammatory domain of HMGB1 to the B box (21). Immature DCs were exposed to rB box or other known maturation stimuli: LPS, CyC, nonmethylated CpG oligonucleotides, and CD40L (see Materials and Methods). The rB box increased the cell surface density of CD83, CD54, CD58 CD40, and MHC class II and decreased the density of the macrophage mannose receptor, CD206. The B box-induced changes were quantitatively similar to those produced by the other stimuli (Fig. 1⇓B). HMGB1 as well as the HMGB1 B box induce phenotypic maturation of DCs. A, FACS analysis of immature DCs cultured in the presence of medium (dotted line) or increasing amounts of rHMGB1: 0.1 (interrupted line), 1.0 (thin line), or 10.0 (thick line) μg/ml. DCs were analyzed for expression of the indicated markers by surface membrane immunofluorescence techniques using PE- or FITC-conjugated mAbs. B, Immature DCs were cultured with rB box (100 μg/ml), LPS (100 ng/ml), CyC (see Materials and Methods), nonmethylated CpG oligonucleotides (CpG), or CD40L or were left untreated (medium). Phenotypic maturation of DCs was assessed as described above. Results represent the mean ± SEM of three independent experiments using DCs generated from different donors. In addition to changes in surface molecule expression, the secretion of inflammatory cytokines and chemokines characterizes DC maturation. 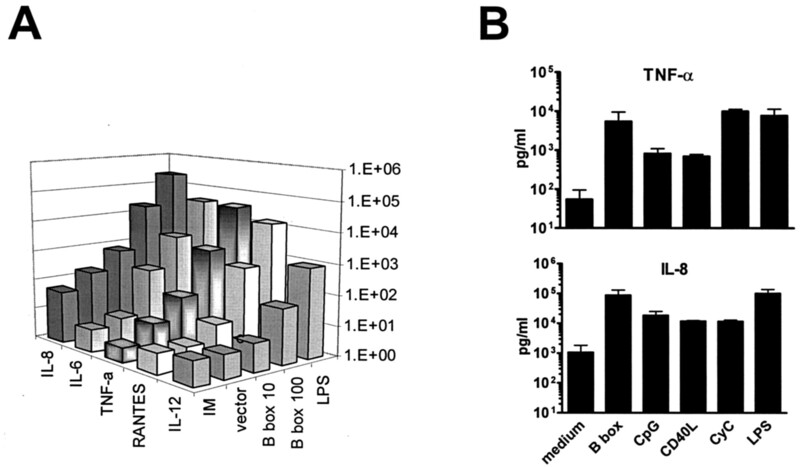 The rB box, when cultured with immature DCs, induced the secretion of IL-12 (p70), TNF-α, IL-6, IL-1α, RANTES, and IL-8 (Fig. 2⇓A). IL-10 levels were either not detected or were very low (<10 pg/ml). IL-2, IFN-α, and TGF-β did not increase beyond detectable levels (data not shown). The GST control (see Materials and Methods; vector) did not induce the secretion of these factors (Fig. 2⇓A). Furthermore, the rB box induced the secretion of IL-8 and TNF-α at levels similar to those produced by the other stimuli (Fig. 2⇓B). B box enhances the secretion of cytokines and chemokines in DCs. A, Immature DCs were cultured in the presence of 1) vector at 100 μg/ml, 2) rB box at 10 or 100 μg/ml, or 3) LPS at 10 ng/ml. Polymyxin B (200 U/ml) was added to all cultures except those treated with LPS. One representative example of four experiments is shown. B, Immature DCs were cultured with rB box (100 μg/ml), LPS (100 ng/ml), CyC, nonmethylated CpG oligonucleotides (CpG), or CD40L or were left untreated (IM). Secreted cytokine levels were measured by ELISA. Results represent the mean ± SEM of three independent experiments using DCs generated from different donors. All experiments using the rB box were performed in the presence of polymyxin B at concentrations sufficient to neutralize >10-fold the amount of contaminating LPS in rB box preparations (Fig. 3⇓, A and B). Additional evidence for the specificity of these observations was obtained by digesting the rB box with trypsin, which is known to abrogate the macrophage stimulatory activity of HMGB1, but has no effect on the activity of LPS (11). Neither the trypsin-treated rB box nor the recombinant protein control (GST) elicited the secretion of inflammatory cytokines (Fig. 3⇓C). Furthermore, the GST control did not up-regulate CD83 expression (Fig. 3⇓F). B box-induced DC maturation is not due to LPS. A, Immature DCs were cultured in the presence of 100 μg/ml B box and polymyxin B (B box + PM); 10 ng/ml LPS, 10 ng/ml LPS and polymyxin B (LPS+PM); or polymyxin B alone (IM+PM). ELISA was used to analyze cell culture supernatants for TNF-α. The results shown are the mean ± SEM of three independent experiments using DCs generated from different donors. B, Immature DCs were cultured in the presence of 10 ng/ml LPS or 10 ng/ml LPS and polymyxin B (LPS+PM) or were treated with polymyxin B alone (IM+PM). Surface membrane expression of CD83 was analyzed by FACS. The results shown are the mean ± SEM of two independent experiments using DCs generated from different donors. C, Immature DCs were cultured in the presence of 100 μg/ml rB box (B box) or 100 μg/ml trypsin-digested rB box (B box-trypsin) or were left untreated (IM+PM). Polymyxin B (100 U/ml) was added to all cultures. 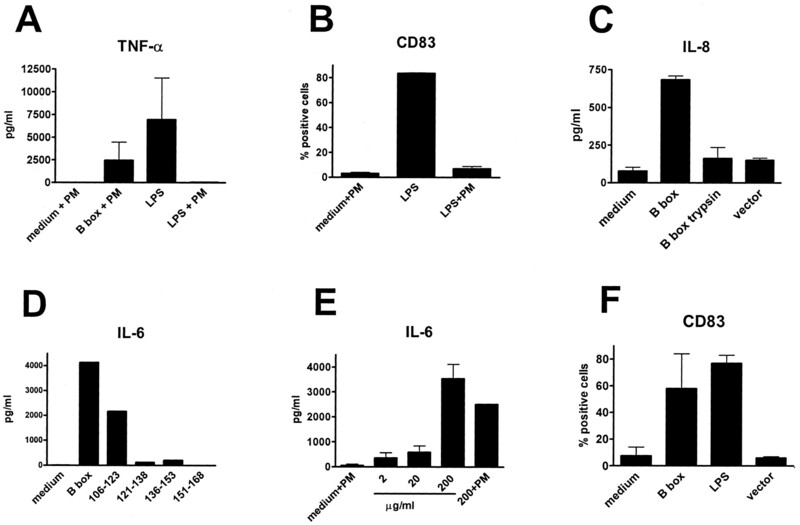 IL-8 levels were analyzed by ELISA. The results shown are the mean ± SEM of three independent experiments using DCs generated from different donors. D, Immature DCs were cultured in the presence of 1) medium, 2) rB box (100 μg/ml), 3) peptide aa 106–123, 4) peptide aa 121–138, 5) peptide aa 136–153, and 6) peptide aa 151–168. The amino acid sequences are numbered based on the primary HMGB1 sequence. The peptides were added at 200 μg/ml. One of three representative experiments is shown. ELISA was used to analyze IL-6 levels in the culture medium. E, Immature DCs were stimulated with HMGB1 peptide aa 106–123 at 0.02–200 μg/ml, with 200 μg/ml peptide and 200 U/ml polymyxin B (200 +PM), or with polymyxin B alone (medium + PM). IL-6 levels were measured by ELISA. The results shown are the mean ± SEM of two independent experiments using DCs generated from different donors. F, Immature DCs were cultured in the presence of B box (100 mg/ml), LPS (100 ng/ml), or GST control (vector) or were left untreated (medium). Forty-eight hours after activation, the surface expression of CD83 by DCs was measured by FACS. The results shown are the mean ± SEM of two independent experiments using DCs generated from different donors. Similar observations were made using chemically synthesized, overlapping, 17-aa-long peptides that span the B box. The synthetic peptide CSEYRPKIKGEHPGLSIG, which corresponds to HMGB1 aa 106–123, specifically stimulated IL-6 release (Fig. 3⇑, D and E) to levels comparable to those produced by the rB box. The synthetic peptides had no detectable levels of LPS; addition of polymyxin to these cultures did not alter the observed results significantly. Thus, the rB box and a chemically synthesized B box peptide specifically stimulate DC maturation. Mature, cytokine-producing DCs induce T cell activation and proliferation, leading to the development of adaptive immunity (1, 2). In coculture experiments, DCs matured by exposure to B box, activated resting allogeneic T cells. The magnitude of this stimulation was equivalent to DCs that had been matured by exposure to LPS, CyC, nonmethylated CpG oligonucleotides, or CD40L (Fig. 4⇓A), indicating that the rB box induced functional maturation of DCs. DCs matured with rB box or the other stimuli were cultured with allogeneic T cells for 5 days, and subsequently the culture supernatants were analyzed for the presence of Th1 and Th2 cytokines. IFN-γ levels were the highest in the rB box-matured DC-T cell cocultures (Fig. 4⇓B). All stimuli up-regulated IL-2 ∼7-fold over immature DCs. IL-2 levels in rB box-stimulated DC cultures (51.1 ± 22.4 pg/ml) were similar to those produced by the other stimuli (42.4 ± 8.4 pg/ml). IL-5 was up-regulated by each of the stimuli, albeit to differing levels: CyC-stimulated DCs 42-fold over immature DCs (277.4 ± 242.6 pg/ml), rB box activated DCs 26-fold (143.7 ± 142.4 pg/ml), and the other stimuli activated DCs 12-fold (147.2 ± 30 pg/ml). IL-4 was not detected after exposure to any of the stimulants. The rB box-stimulated DCs enhance the proliferation of allogeneic T cells and induce a Th1 profile. A, Immature day 7 DCs were incubated for 48 h with 1) rB box (100 μg/ml), 2) LPS (100 ng/ml), 3) CyC, 4) nonmethylated CpG oligonucleotides, or 5) trimeric CD40L. DCs were then cocultured with 105 allogeneic T cells at a DC:T cell ratio of 1:120. T cell proliferation was assessed by measuring the amount of [3H]thymidine incorporated during the last 8 h of a 5-day culture period. A representative example of five independent experiments is shown as the mean cpm ± SEM from triplicate cultures. B, After a 5-day coculture of allogeneic T cells and DCs (DC:T ratio, 1:120) that had previously been activated with the same stimuli as described above, cell culture supernatants were analyzed for the presence of IFN-γ by ELISA. The results shown are the mean ± SEM of three independent experiments using DCs generated from different donors. HMGB1 is a ligand for RAGE, a membrane protein that transduces intracellular signaling, thereby leading to nuclear translocation of NFκB (22, 23). Using immunofluorescence techniques, RAGE was detected on the cell surface of immature DCs (Fig. 5⇓A). As signaling through NF-κB also plays a role in DC maturation (24, 25, 26), we tested whether B box activated NF-κB using an EMSA. As expected, immature DCs showed no active NF-κB (27), whereas B box-stimulated DCs expressed levels of active NF-κB comparable to those produced by CyC and LPS (Fig. 5⇓B). To identify the NF-κB subunits involved in B box-induced intracellular signaling, nuclear extracts from B box-activated DCs were analyzed by supershift assay. Anti-p65 Ab caused a significant supershift in protein/DNA complex motility, indicating that the p65 subunit is a component of the complex activated by the B box (Fig. 5⇓C). Abs against p52 and Rel B did not cause supershifts (data not shown). Unlabeled NF-κB-specific DNA probes displaced the NF-κB-DNA complex, indicating specificity for the NF-κB consensus sequence (Fig. 5⇓C). A, Immature DCs express RAGE on the cell surface. Immature DCs were stained with either isotype control (Ig) or unlabeled anti-RAGE Abs and subsequently with FITC-conjugated goat anti-rabbit to detect the primary Ab. Data are shown from one representative experiment of three similar experiments performed using DCs from different donors. B, The rB box induces NF-κB activation. Immature DCs were cultured in the presence of CyC, LPS (100 ng/ml), nonmethylated CpG oligonucleotides (CpG), or rB box (100 μg/ml) or were left untreated (IM) for 48 h. Nuclear extracts were analyzed for active NF-κB. Shown is a representative of two experiments. C, Supershift analysis of NF-κB activation. Immature DCs were cultured in the presence of rB box (100 μg/ml) or were left untreated (IM) for 2 h. The supershift was conducted with the indicated Abs using nuclear extracts from B box-stimulated DCs. Specific DNA-protein complexes were verified by competing for the DNA-binding site with unlabeled cold probe (co). Data represent similar observations made in two independent experiments. To obtain insight into the roles of ERK and p38 MAPK pathways in B box-induced DC maturation, we used their specific inhibitors, PD98059 and SB203580, respectively. To analyze the role of NF-κB, we used TPCK, a serine protease inhibitor that blocks nuclear translocation of Rel/NF-κB by preventing IκB degradation. The p38 MAPK inhibitor SB203580, but not the other inhibitors, completely abrogated B box-induced up-regulation of CD83 and down-regulated B box-induced secretion of IL-6 (Fig. 6⇓). The B box causes CD38 up-regulation and IL-6 secretion via a p38-dependent pathway. Immature day 7 DCs were preincubated for 30 min with 1) DMSO, 2) PD98059 at 20 (P20) or 80 (P80) μM, 3) SB203580 at 5 (S5) or 20 (S20) μM, or 4) TPCK at 20 (T20) or 80 (T80) μM and then were treated with rB box (100 μg/ml) or were cultured with DMSO in the absence of B box (medium). Forty-eight hours after activation the DCs were assayed for the surface expression of CD83 by FACS, and IL-6 secretion was measured by ELISA. The results shown are the mean ± SEM of three independent experiments using DCs generated from different donors. Our results demonstrate that HMGB1 as well as the rB box are potent maturation stimuli for DCs. Furthermore, as the rB box induces secretion of IL-12 by DCs and production of IL-2 and IFN-γ by T cells, the rB box functions as a Th1-polarizing stimulus. The receptor involved in HMGB1-mediated DC activation is not yet fully defined, although HMGB1 is a specific ligand for RAGE (22). Signaling through RAGE can activate a cascade involving NF-κB (23). We have detected RAGE expression on the surface of immature DCs and found that B box induces activation of the p65 (RelA) subunit of NF-κB. This is in agreement with results seen in B box-activated RAW 264.7 cells (21) and HMGB1-activated murine neutrophils (28). The role of this subunit in immunological functions is still unknown. However, a recent report showed that RelA is necessary for the expression of genes in mouse embryonic fibroblasts that are involved in the activation of immune responses (29). 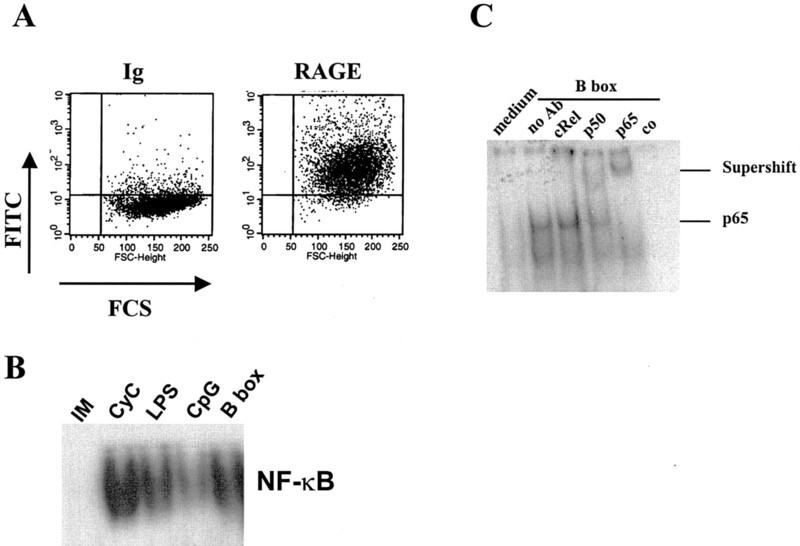 These results raise the possibility that HMGB1 signals DC maturation through RAGE. Interestingly, even though NF-κB activation plays a role in the maturation of human DCs (24, 25, 26), its inhibition using TPCK did not change B box-induced expression of CD83 or alter secreted levels of IL-6. This suggests that B box induces those changes by a NF-κB-independent and p38-dependent mechanism. Another possible receptor for HMGB1 is the TLR2, as there is some evidence that activation of NFκB by necrotic cells depends on TLR2 (30). While the present paper was under review, it was shown that HMGB1 may signal through TLR2 and TLR4 (28) in murine neutrophils isolated from the LPS-resistant mouse strain C3H/HeJ. These results are in contrast to those reported by Yang et al.3 showing that HMGB1, rB box, and B box peptide signal through TLR2, but not TLR4. As in the present study of DC maturation (Fig. 3⇑, D and E), the 17-mer synthetic peptide was sufficient to signal through TLR2. MAPK activation also contributes to the maturation of human DCs (31, 32, 33). Using the p38 MAPK inhibitor SB203580, we found that rB box-induced up-regulation of cell surface CD83 and secretion of IL-6 by DCs was dependent on the p38 MAPK pathway. In addition, as ERK has been implicated in cell survival of a murine DC cell line (26), we inhibited the ERK pathway using the specific MEK1/2 inhibitor PD98059; this inhibition altered neither B box-induced CD83 expression nor IL-6 secretion. Collectively these data demonstrate that HMGB1 and its B box can function as maturation stimuli for human monocyte-derived immature DCs and, as such, represent endogenous immunostimulatory molecules. Endogenous DC-stimulating factors are intriguing because they may represent a class of well-tolerated natural adjuvants (5). In contrast, such molecules may facilitate the breaking of tolerance and thereby promote or potentiate autoimmunity. Elevated levels of HMGB1 have been detected in the synovial fluid of patients with rheumatoid arthritis (20), and HMGB1 injected into the joints of mice induces arthritic changes (13). The amount of HMGB1in synovial fluid is similar to the amount of HMGB1 that we found sufficient to induce DC maturation in vitro. Local microenvironments in other autoimmune diseases such as systemic lupus erythematosus or multiple sclerosis may also have high HMGB1 levels, providing a milieu in which DCs could be activated by self-Ags. We thank Catherine Rapelje for FACS analyses. We particularly thank Drs. Joost Oppenheim, De Yang, and Kirk Manogue for critical reading of the manuscript. ↵2 Abbreviations used in this paper: DC, dendritic cell; CyC, cytokine mixture; HMGB1, high mobility group box protein 1; RAGE, receptor for advanced glycation end products; rB box, recombinant B box; TLR, Toll-like receptor; TPCK, N-tosyl-l-phenylalanine chloromethyl ketone. ↵3 M. Yu, H. Wang, J. Li, L. Yang, R. Obar, W. Newman, J. M. Mason, D. T. Golenbock, E. Latz, C. J. Czura, M. J. Fenton, U. Andersson, K. J. Tracey, and H. Yang. HMGB1 signals through Toll-like receptor 2. Submitted for publication. Rescigno, M., C. Winzler, D. Delia, C. Mutini, M. Lutz, P. Ricciardi-Castagnoli. 1997. Dendritic cell maturation is required for initiation of the immune response. J. Leukocyte Biol. 61:415. De Smedt, T., B. Pajak, E. Muraille, L. Lespagnard, E. Heinen, P. De Baetselier, J. Urbain, O. Leo, M. Moser. 1996. 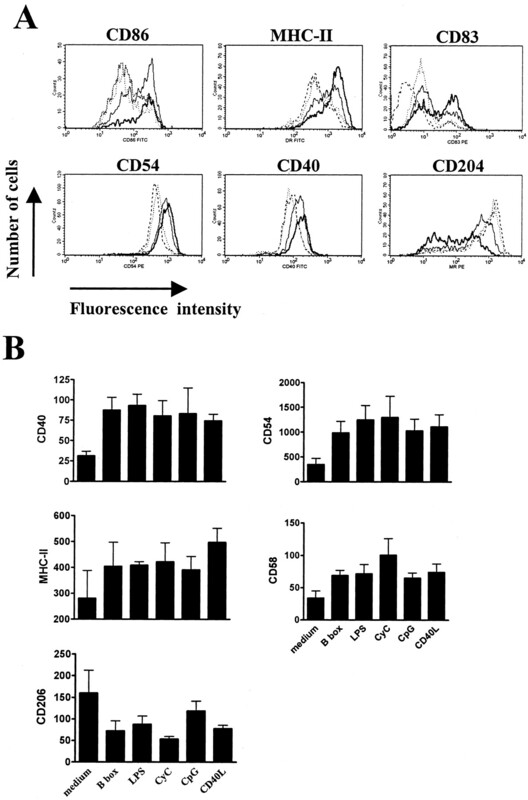 Regulation of dendritic cell numbers and maturation by lipopolysaccharide in vivo. J. Exp. Med. 184:1413. Hartmann, G., G. J. Weiner, A. M. Krieg. 1999. CpG DNA: a potent signal for growth, activation, and maturation of human dendritic cells. Proc. Natl. Acad. Sci. USA 96:9305. Gallucci, S., P. Matzinger. 2001. Danger signals: SOS to the immune system. Curr. Opin. Immunol. 13:114. Gallucci, S., M. Lolkema, P. Matzinger. 1999. Natural adjuvants: endogenous activators of dendritic cells. Nat. Med. 5:1249. Sauter, B., M. L. Albert, L. Francisco, M. Larsson, S. Somersan, N. Bhardwaj. 2000. Consequences of cell death: exposure to necrotic tumor cells, but not primary tissue cells or apoptotic cells, induces the maturation of immunostimulatory dendritic cells. J. Exp. Med. 191:423. Basu, S., R. J. Binder, R. Suto, K. M. Anderson, P. K. Srivastava. 2000. Necrotic but not apoptotic cell death releases heat shock proteins, which deliver a partial maturation signal to dendritic cells and activate the NF-κB pathway. Int. Immunol. 12:1539. Goodwin, G. H., C. Sanders, E. W. Johns. 1973. A new group of chromatin-associated proteins with a high content of acidic and basic amino acids. Eur. J. Biochem. 38:14. Wang, H., O. Bloom, M. Zhang, J. M. Vishnubhakat, M. Ombrellino, J. Che, A. Frazier, H. Yang, S. Ivanova, L. Borovikova, et al 1999. HMG-1 as a late mediator of endotoxin lethality in mice. Science 285:248. Andersson, U., H. Wang, K. Palmblad, A. C. Aveberger, O. Bloom, H. Erlandsson-Harris, A. Janson, R. Kokkola, M. Zhang, H. Yang, et al 2000. High mobility group 1 protein (HMG-1) stimulates proinflammatory cytokine synthesis in human monocytes. J. Exp. Med. 192:565. Wang, H., H. Yang, C. J. Czura, A. E. Sama, K. J. Tracey. 2001. HMGB1 as a late mediator of lethal systemic inflammation. Am. J. Respir. Crit. Care Med. 164:1768. Pullerits, R., I. M. Jonsson, M. Verdrengh, M. Bokarewa, U. Andersson, H. Erlandsson-Harris, A. Tarkowski. 2003. High mobility group box chromosomal protein 1, a DNA binding cytokine, induces arthritis. Arthritis Rheum. 48:1693. Abraham, E., J. Arcaroli, A. Carmody, H. Wang, K. J. Tracey. 2000. HMG-1 as a mediator of acute lung inflammation. J. Immunol. 165:2950. Scaffidi, P., T. Misteli, M. E. Bianchi. 2002. Release of chromatin protein HMGB1 by necrotic cells triggers inflammation. Nature 418:191. Wang, H., J. M. Vishnubhakat, O. Bloom, M. Zhang, M. Ombrellino, A. Sama, K. J. Tracey. 1999. Proinflammatory cytokines (tumor necrosis factor and interleukin 1) stimulate release of high mobility group protein-1 by pituicytes. Surgery 126:389. Bustin, M., D. A. Lehn, D. Landsman. 1990. Structural features of the HMG chromosomal proteins and their genes. Biochim. Biophys. Acta 1049:231. Bustin, M., R. Reeves. 1996. High-mobility-group chromosomal proteins: architectural components that facilitate chromatin function. Prog. Nucleic Acids Res. Mol. Biol. 54:35. Yang, H., H. Wang, C. J. Czura, K. J. Tracey. 2002. HMGB1 as a cytokine and therapeutic target. J. Endotoxin Res. 8:469. Kokkola, R., E. Sundberg, A. K. Ulfgren, K. Palmblad, J. Li, H. Wang, L. Ulloa, H. Yang, X. J. Yan, R. Furie, et al 2002. High mobility group box chromosomal protein 1: a novel proinflammatory mediator in synovitis. Arthritis Rheum. 46:2598. Li, J., R. Kokkola, S. Tabibzadeh, R. Yang, M. Ochani, X. Qiang, H. E. Harris, C. J. Czura, H. Wang, L. Ulloa, et al 2003. Structural basis for the proinflammatory cytokine activity of high mobility group box 1. Mol. Med. 9:37. Hori, O., J. Brett, T. Slattery, R. Cao, J. Zhang, J. X. Chen, M. Nagashima, E. R. Lundh, S. Vijay, D. Nitecki. 1995. The receptor for advanced glycation end products (RAGE) is a cellular binding site for amphoterin: mediation of neurite outgrowth and co-expression of rage and amphoterin in the developing nervous system. J. Biol. Chem. 270:25752. Huttunen, H. J., C. Fages, H. Rauvala. 1999. Receptor for advanced glycation end products (RAGE)-mediated neurite outgrowth and activation of NF-κB require the cytoplasmic domain of the receptor but different downstream signaling pathways. J. Biol. Chem. 274:19919. Clark, G. J., S. Gunningham, A. Troy, S. Vuckovic, D. N. Hart. 1999. Expression of the RelB transcription factor correlates with the activation of human dendritic cells. Immunology 98:189. Neumann, M., H. Fries, C. Scheicher, P. Keikavoussi, A. Kolb-Maurer, E. Brocker, E. Serfling, E. Kampgen. 2000. Differential expression of Rel/NF-κB and octamer factors is a hallmark of the generation and maturation of dendritic cells. Blood 95:277. Messmer, D., J. Bromberg, G. Devgan, J. M. Jacque, A. Granelli-Piperno, M. Pope. 2002. Human immunodeficiency virus type 1 Nef mediates activation of STAT3 in immature dendritic cells. AIDS Res. Hum. Retroviruses 18:1043. Park, J. S., D. Svetkauskaite, Q. He, J. Y. Kim, D. Strassheim, A. Ishizaka, E. Abraham. 2004. Involvement of toll-like receptors 2 and 4 in cellular activation by high mobility group box 1 protein. J. Biol. Chem. 279:7370. Ouaaz, F., M. Li, A. A. Beg. 1999. A critical role for the RelA subunit of nuclear factor κB in regulation of multiple immune-response genes and in Fas-induced cell death. J. Exp. Med. 189:999. Aicher, A., G. L. Shu, D. Magaletti, T. Mulvania, A. Pezzutto, A. Craxton, E. A. Clark. 1999. Differential role for p38 mitogen-activated protein kinase in regulating CD40-induced gene expression in dendritic cells and B cells. J. Immunol. 163:5786. Sato, K., H. Nagayama, K. Tadokoro, T. Juji, T. A. Takahashi. 1999. Extracellular signal-regulated kinase, stress-activated protein kinase/c-Jun N-terminal kinase, and p38mapk are involved in IL-10-mediated selective repression of TNF-α-induced activation and maturation of human peripheral blood monocyte-derived dendritic cells. J. Immunol. 162:3865. Arrighi, J. F., M. Rebsamen, F. Rousset, V. Kindler, C. Hauser. 2001. A critical role for p38 mitogen-activated protein kinase in the maturation of human blood-derived dendritic cells induced by lipopolysaccharide, TNF-α, and contact sensitizers. J. Immunol. 166:3837.